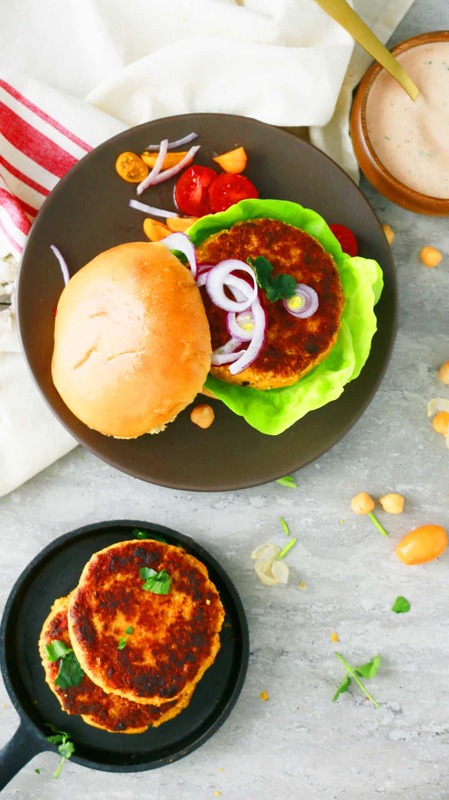 This spicy garbanzo bean burger is your answer for a quick weeknight dinner! 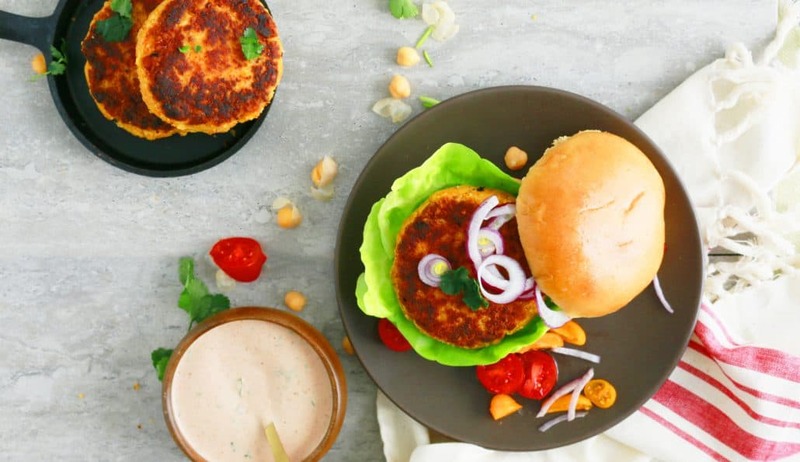 Garbanzo beans and carrot patties with a garam masala spiked sauce is delicious as is, served alongside a salad or as a burger. I love easy weeknight recipes, better yet if it’s vegetarian ( great opportunity to sneak in some veggies into those kiddos).This is one such recipe that has been a family favorite. May be because it’s in the form of a burger and sure makes a meatless Monday (or Thursday) exciting. 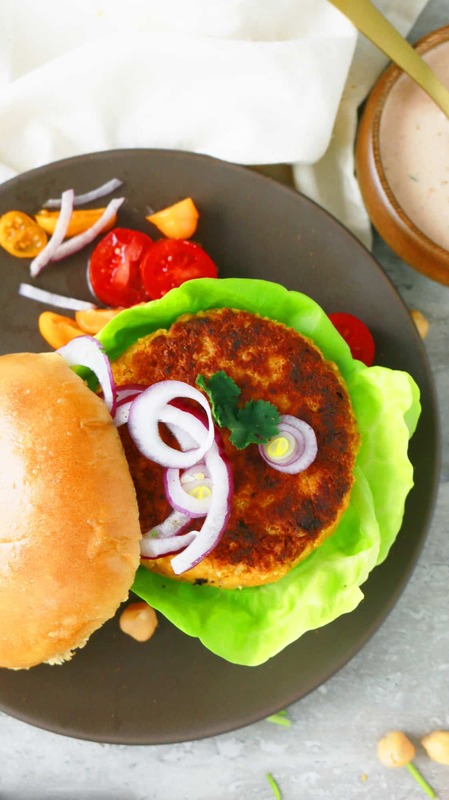 A must have veggie burger recipe! It starts with one of my favorite pantry staple, canned garbanzo <– healthy, versatile, nutritious and yummy. 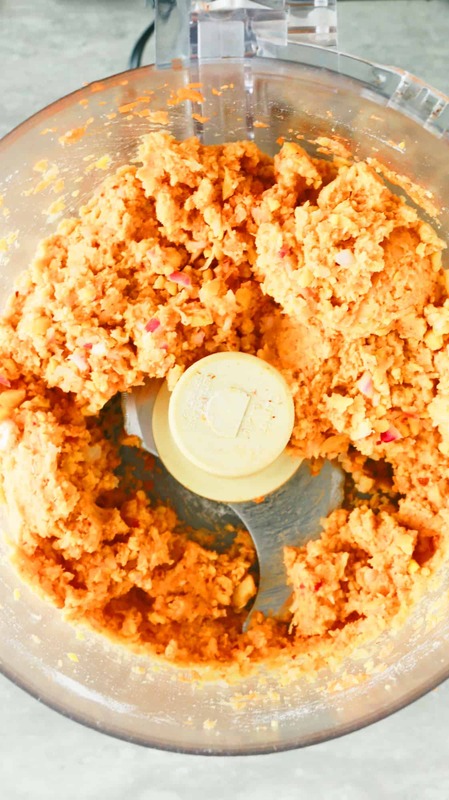 Coarsely grind ingredients in a food processor, shape and pan fry. Stir all sauce ingredients together. Garam masala powder is a ground mix of many different aromatic Indian spices. 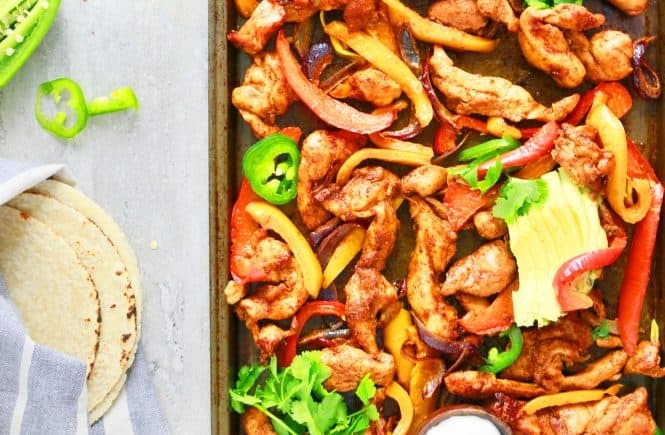 But, you can totally make this recipe without it and it still would be delicious (less spicy but delicious). I love to enjoy this patty and sauce with a salad for lunch. The recipe first appeared here. 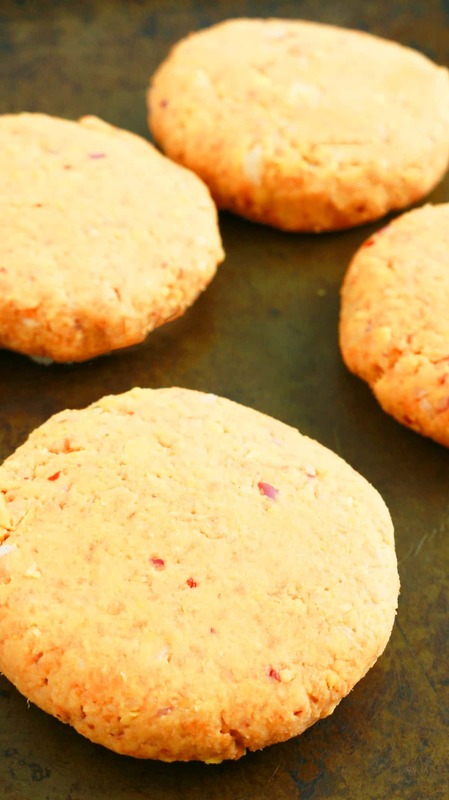 To make baked chickpea burger: Add 1 tablespoon vegetable oil along with all patty ingredients and process. Shape into 4 patties, place on a greased cookie sheet, spray a coating of non-stick cooking spray on top. Bake for about 30 minutes in a preheated 450 degree oven. Place pan on a wire rack to cool (DO NOT try to remove patties while it’s hot. 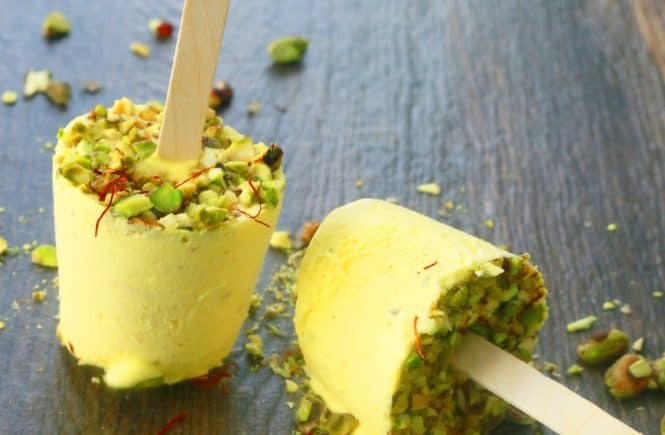 Let it cool down until warm or room temperature. Patty with firm up as it cools) and enjoy. I like the pan fried ones as it forms a thin crisp crust on the outside. So delicious. 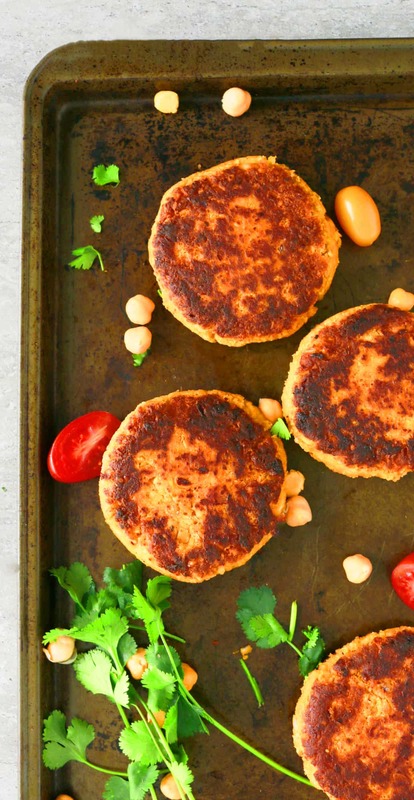 This spicy garbanzo bean burger is your answer for a quick weeknight dinner! 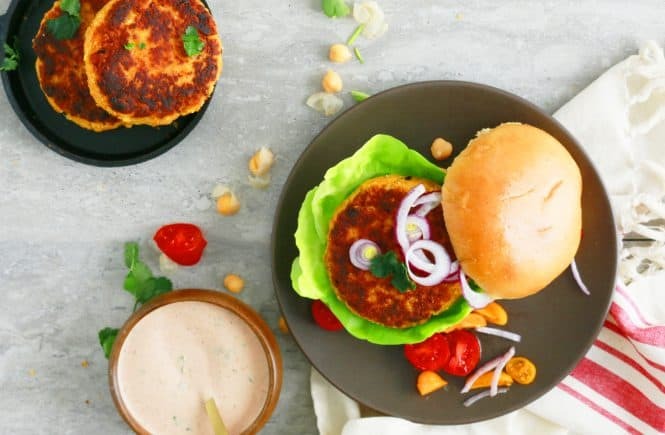 Garbanzo bean and carrot patties with a garam masala spiked sauce is delicious as is, served alongside a salad or as a burger. 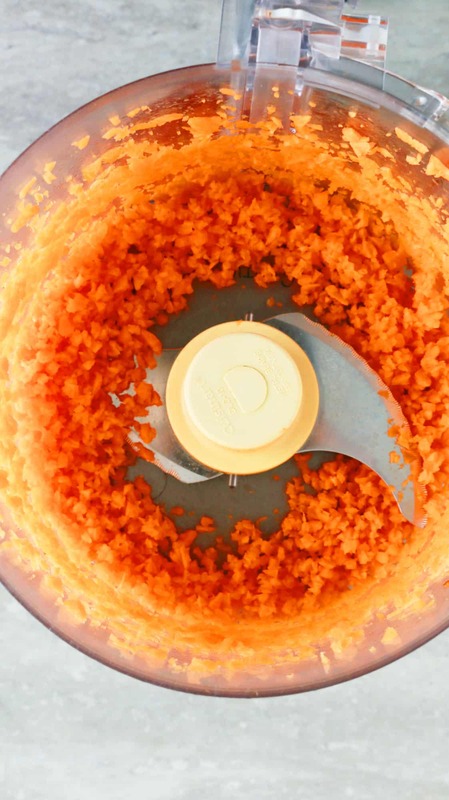 Add carrot slices into a food processor, process for few seconds, until coarsely ground. Scrape the sides and lid. Add all the remaining garbanzo bean patty ingredients (except oil) and process for about 15 seconds, until it starts to gather together (turn off machine once in between, stir mixture with a spoon). Divide mixture into 4 equal portions and shape into 1/2 - 3/4 inch thick patty. Stir all sauce ingredients together (can be made ahead and stored in the refrigerator). 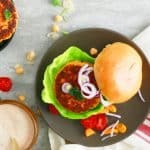 Spread some garam masala sauce on top of the bottom bun, place a patty and then top with lettuce, sliced onion and tomato. Close with top bun and eat. Patty is delicious served as is with sauce or on a salad. 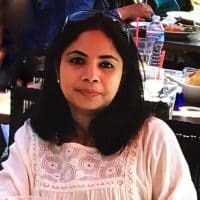 If you do not have garam masala powder, make recipe as is (omitting garam masala powder). Will be less spicy but still delicious. For baking option: Add 1 tablespoon vegetable oil along with all patty ingredients and process. Shape into 4 patties, place on a greased cookie sheet, spray a coating of non-stick cooking spray on top. Bake for about 30 minutes in a preheated 450 degree oven. Place pan on a wire rack to cool (DO NOT try to remove patties while it's hot. 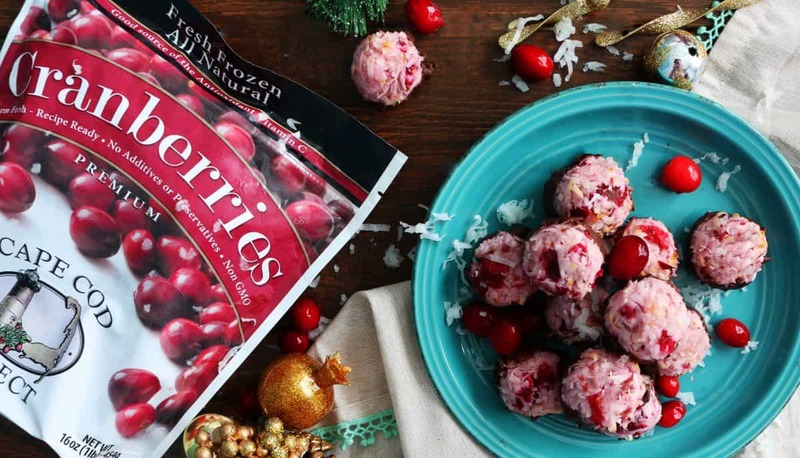 Let it cool down (patty with firm up as it cools) and enjoy. This is such a lovely recipe for a vegetarian patty! I love how quick it is 😀 And that sauce sounds delicious as well! Love garbanzo beans!! And these patties are perfect….so healthy!! Veggie burgers are the best – I often actually prefer them to meat!! I’ve never tried a version with chickpeas. Loving the spice in here! !